Seaweek is a long-standing national marine awareness program that was originally created by the Marine Education Society of Australasia (MESA). The initial concept for MESA arose at a national meeting of 16 Australian marine educators in December 1984. Once formed MESA quickly grew into an effective organisation representing and supporting marine educators in both Australia and New Zealand. However, after 30 years as a standalone organisation MESA took the strategic step of uniting with the Australian Association for Environmental Education (AAEE). As a result, in 2015 MESA morphed into the AAEE group called the Australian Marine Education Network and this group is now maintaining the Seaweek tradition in Australia. The loss of MESA as the coordinating organization for Seaweek had a much greater impact than anticipated when MESA merged with AAEE in 2015. Nevertheless, Seaweek is still alive in Australia and has a new logo and a new name (SeaWeek as opposed Seaweek). 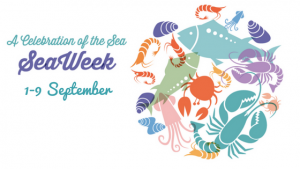 In 2015 SeaWeek celebrations moved from the traditional month of March to September. With the aim of recreating SeaWeek as an effective national celebration of the sea and our links to the ocean we decided to adopt the seven Ocean Literacy Principles as the themes for each of the seven SeaWeeks between 2016 and 2022.